German ex-Formula 1 driver Adrian Sutil has had a seat fitting at the Force India team and may drive in next week's pre-season test. The 30-year-old, who drove for the team in its various guises from 2007-11, is a contender for the vacant seat in 2013 alongside Scot Paul di Resta. Frenchman Jules Bianchi is believed to be the other candidate. Sutil was found guilty of grievous bodily harm in February 2012 and did not race in F1 last year. Force India said at the time that the decision not to retain him was unrelated to his conviction for the incident at a Shanghai nightclub following the Chinese Grand Prix in April 2011. Sutil was given an 18-month suspended sentence and fined 200,000 Euros (then £167,224) in February 2012 after being found guilty of assaulting Eric Lux, an executive with the then-Renault team, now called Lotus. 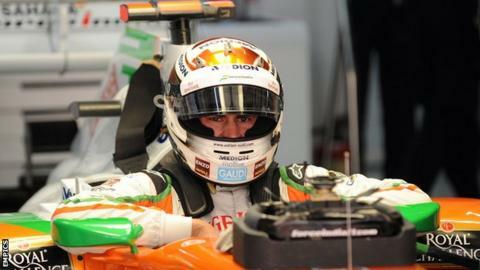 A Force India spokesman said: "Adrian Sutil had a seat fitting with the team this week. "At this stage the test driving schedule for the Barcelona test is not finalised but there is a possibility Adrian could be involved. "The driving schedule will be communicated on Monday next week." The second pre-season test runs at Barcelona's Circuit de Catalunya from Tuesday to Friday next week, 19-22 February. At last week's first pre-season test in Jerez, Force India had Di Resta, reserve driver Bianchi and simulator driver James Rossiter in the car.